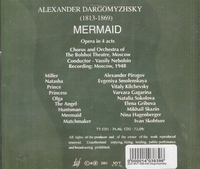 “Alexander Sergeyevich Dargomyzhsky) was a 19th-century Russian composer who bridged the gap in Russian opera composition between Mikhail Glinka and the later generation of The Five and Pyotr Ilyich Tchaikovsky. He was already known as a talented musical amateur when in 1833 he met Mikhail Glinka and was encouraged to devote himself to composition. His opera ESMERALDA (libretto by composer, based on Victor Hugo's THE HUNCHBACK OF NOTRE DAME) was composed in 1839 (performed 1847), and his RUSALKA was performed in 1856. Evgenia Smolenskaya (1919-89) was born in a small village near Gorlovka in the Donbass. She studied at the Yenakiyevo Pedagogical College and upon graduating, became a teacher of Ukrainian and literature. After taking part in the regional Olympiad in Stalino (now Donetsk), she was sent to study at the Kiev Conservatory (1939-41). After the war she was engaged to sing at the opera house in Stalino and continued her musical education under EN Panaeva. In 1947 she joined the Bolshoi Theatre, débuting there in the role of Natasha in Dargomyzhsky’s RUSALKA (a role which she was to record twice). Her other roles included Aïda, Yaroslavana, Santuzza, Kuma, Marcellina, Emma (KHOVANSHCHINA), Maria (MAZEPPA) and Militrisa. She recorded the role of Ortrud (above) in the first studio recording of LOHENGRIN. She also taught at the Gnesin Institute." “Vitaly Kilchevsky (1899-1986) was one of the famous Russian tenors of the Soviet period. For many years he sang as a soloist at theatres in Leningrad - Mikhailovsky (from 1936) and the Mariinsky (from 1944). In Moscow he performed at the Bolshoi between 1947 and 1955. He studied singing under the outstanding singer and teacher Sophia Akimova (wife of the great tenor Ivan Yershov) at the Leningrad Conservatory. One fellow student being the baritone Pavel Lisitsian.